From our orchards to your table. The MAIA-1 variety is marketed as EverCrisp® under strict quality control. EverCrisp® is the ever-craveable apple that everyone will be talking about this year. A yummy snacking apple that holds a powerful crunch – combining the best features of its parent varieties, Honeycrisp and Fuji. This year’s anticipated harvest will place EverCrisp® on select grocers’ shelves starting in late October. A partial list of EverCrisp’s® 2018 availability follows. Want EverCrisp® in your town? 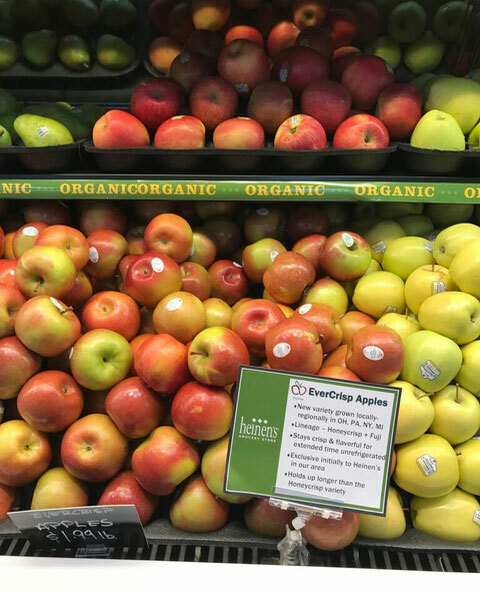 Contact your favorite grocer and ask for EverCrisp apples from the Midwest Apple Improvement Association. 200 S. County Line Rd. 321 N St Jospeh St.
W220 N10540 Amy Belle Rd.